Photograph from a series taken by a guard in the Soviet prisoner-of-war camp of Belzen bei Bergen, and numbered in Roman numerals by the American officer, Lt. van Otten. The camp held approximately 10,000 POWs, most of whom came from Fallingbostel, 10 km away. When they fell ill, they were marched to Belsen. At Belsen, they were starved, often given only a soup made of field beets. 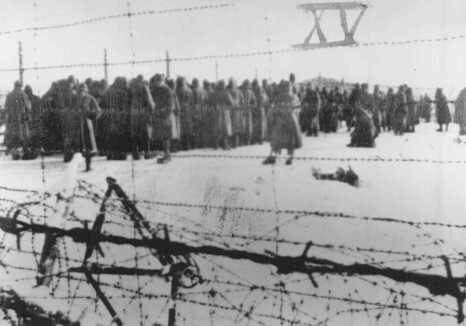 This photo shows Soviet POWs assembled at the camp. Germany, 1941–45.